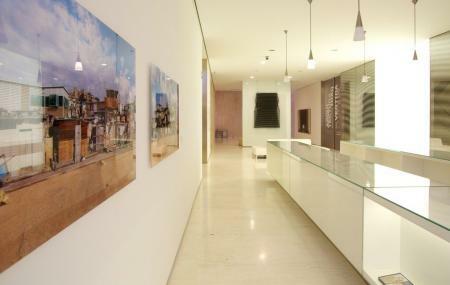 Find hotel near Alicante Museum Of Contem .. The Alicante Museum of Contemporary Art is a municipal museum and is housed in a building dating from 1687. The building was previously a granary. The building was donated to the municipality in the year 1977 by local artist Eusebio Sempere. The museum has three permanent collections- the collection of 20th-century art (including works of Miro, Dali, Juan Gris and Julio González), the Juana Frances Collection and the Eusebio Sempere Collection. How popular is Alicante Museum Of Contemporary Art? People normally club together Santa Barbara Castle and Gravina Museum Of Fine Arts while planning their visit to Alicante Museum Of Contemporary Art. Beautiful museum with very friendly staff (apart from the security, i felt like a ghost when greeting them). There is a lot to see and it is located in a beautiful central area,plus it is free. It is definitely worth checking it out! Nice museum with Miro and Vasarely works among others. Great to rest here from crowds. Actually apart from walk to Santa Barbara castle this is my greatest experience in Alicante. Free to enter. Open till 8 pm. The temporary exhibit was quite interesting. The permanent collections were alright to pass the time but nothing unmissable! Very informative yet easy to follow explanations of the exhibitions. Little to no diversity in the artists on show though, so big claims such as the collections representing the state of art in Spain over the last century or so aren't entirely true. Small museum located in the old part of town. Great if you desperately need a fix of modern art. Not worth going out of your way for. Free so that’s always a plus.